Gone are the days when you used the outdoor string lights only on Xmas. We don’t need an occasion for these types of outdoor lights and we all like to have a nice, romantic or fun vibe in our yard on regular basics. What’s the thing with outdoor string lights? You may use outdoors string lights for aesthetic reasons, but also for safety as they may illuminate the dimly lit areas. The market gives you plenty of options and you can go with the traditional incandescent bulbs or LED lights. As for the power, you don’t have to use any more string lights that have to be plugged into an electrical outlet, but try the more economical solar powered or battery-powered lights. If you’re looking for low-priced, with easy to find replacements, then the string lights with incandescent bulbs are the best option for you. They look great and come in many shapes and size, but do come with an important twist: they’re not quite energy efficient and do overheat, becoming risky. On the other hand, LED lights are more energy efficient, but they’re kind of new which is why the diversity of shapes and sizes is still extending. Even though you may feel in the beginning that you’re paying the extra buck for them, LEDs need up to 90% less energy and you’re definitely gonna notice it in your electricity bills. As for the power, you may give it a go with the solar powered string lights that are cost and energy efficient. Solar panels may support both LEDs and incandescent bulbs, but it’s the solar LEDs lights that rocks a yard for the whole year. You can also get battery-operated lights, but you need to pay for more durable battery, typically rechargeable ones. Let’s not forget the rope lights or tube lights that aren’t used only by marine anymore. They are quite inexpensive and there are various colors and thickness you may find. They are weather protected and don’t break that easily. You get the final call as it’s your outdoors and you want to feel comfortable. No matter your decision, it’s good to know you got more than two options to choose from. 1). Cute and easy to use indoors and outdoors, the Globe String Light,Dailyart LED Starry Light Fairy Light for Garden are a great little helper for decorating your residence. The 13ft. lights feature 40 translucent globes and the distance between the 0.7-inch globes is 4 inch. The globes may look fragile, but they are made of translucent plastic so they are more non-friable than glass models. The LEDs give enough brightness, but the risk for overheat is minimal. The lights are versatile and you get to set one of the three modes when using them: steady or on flash. As they are battery powered, you need 3AA batteries for using the lights. The warm light, the versatility and pretty looks make the lights a low-priced option to consider when shopping. All in all, for the little money you pay, the lights aren’t quite a lemon when in need. 2). 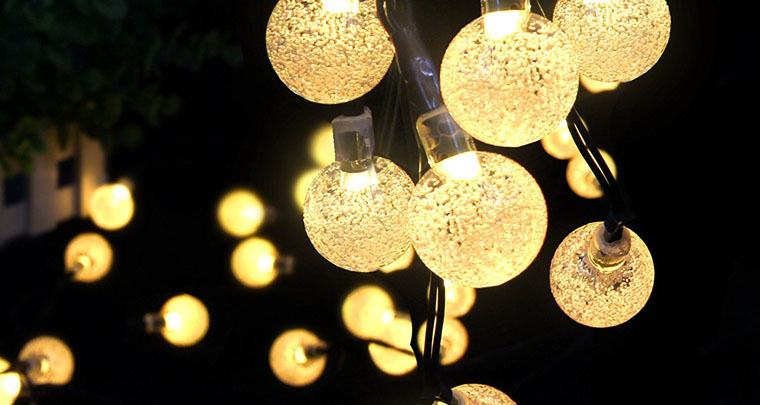 Let your creativity flow with the MineTom 100 LED 36 ft. Globe String Lights and decorate your favorite place outdoors or indoors. You get 100LEDs on 36ft. long wire that you may easily bend and twist, for the best decoration of the designated area. The bulbs are 4.3 in placed from each other so they look pretty and bring a nice, bright light in any space. You may actually scotch-tape the lights, even though the chord is a bit heavyweight. The globes aren’t made of glass, but of translucent plastic, so are non-friable. The build of the lights is good and they don’t overheat after several hours of use. They are also waterproof, so they’re safe for the outdoors. The power consumption is low and the lights are a great choice for the fixed budget. You may use the lights all year long due to their construction. They are tiny, but bright and include so many lights. For the cute looks, bright light and durable feel, the lights sure don’t disappoint when shopping on a fixed budget. 3). 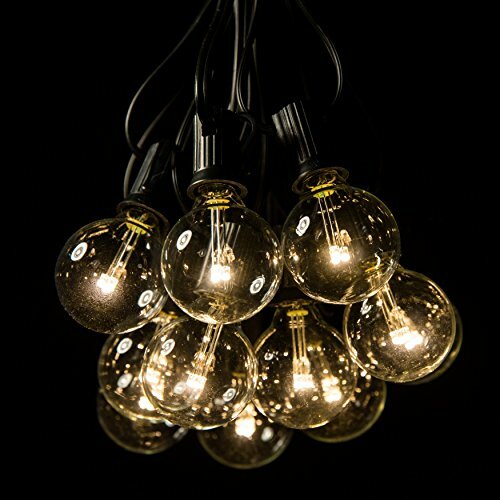 If you are the traditional customer and only want to go with conventional bulbs, put your trust and faith in the 25Ft G40 Globe String Lights with Clear Bulbs. You may want to take them with a pinch of salt as the lights sure look nice, but may not take a fall. The 25ft. long string features 25 clear G40 bulbs that give a warm, nice light. The light bulbs present candelabra (E12) socket base and are made with glass. The lights are waterproof and build for the outdoors, but you may want to get replacements for the very beginning. You may definitely use them indoors also, but they shine so much better on your patio, porch or on a party. Some numbers may give you an idea about how the lights would look in your garden. They include 6” lead with male plug, 6” tail with female connector and there’s 12” spacing between bulbs. 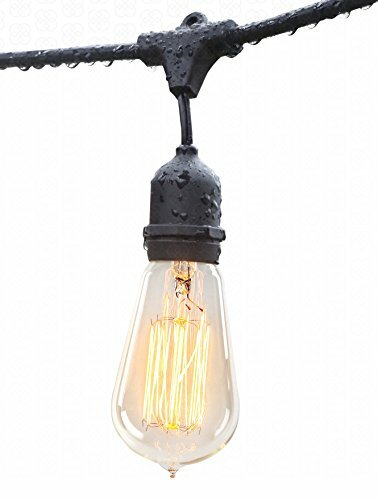 The lights give a soft, warm glow and aren’t difficult to hang as the bulbs are lightweight. They have a solid build and may feel stiff right out of the box, but they do end up flexible and easy to hang after a minute or so. Versatile and bright, the lights are a good option for many. All in all, for the warm light and nice looks, you shouldn’t sit on a fence when considering the lights for illuminating your outdoors. 4). If you want to install outdoor string lights but also to keep your monthly electricity bill low, don’t hesitate to give it a go with the Litom Outdoor Solar String Lights 200 LED Solar Decorative Power Lights. The solar string lights come with many good things and you may use the 8 different modes for more diversity in your backyard. They feature two switches, on for power (on/off) and the other one to switch between the modes. Here are the modes to choose from: sequential, waves, slo-glo, slow fade chasing/flash, steady, twinkle/flash and combination. The solar panel charges throughout the day and ensures an 8 hours run for the lights at night. The lights actually turn on automatically at dusk and turn off the same way in the morning. The battery is efficient and holds its charge. The maximum output of the lights is 200 lumens and the LEDs are quite bright in the dark. The wires are thin and you just need to let your ideas flow for a creative and fun display of the lights. You do get 72.18 ft. long string, which is enough for wrapping a tree, or decorate your porch. You may also place the solar panel where it gets the best sunlight exposure, as the distance from the first LED to the solar panel is 6ft. The lights have an IP44 waterproof grade, which means they can take a splash or a rainy day. As for the build, we notice the lights are well made and need little to no maintenance. They are easy to install and may surprise with their performance. Despite the cons, for the nice light, versatility and good build, not to mention the save on your electricity bill, the lights are worth to try at least for one summer. 5). Entirely waterproof and great for the indoors as well, the LED String Lights 66ft 200 LEDs TaoTronics Dimmable Festival Decorative Lights sure give you plenty of options for decorating your favorite spaces in and out of the house. The very long 66ft. copper wire features 200 LEDs so you may get highly creative when decorating. Either you do it for Xmas or for a wedding, the lights sure don’t limit your ideas. You may control the rope lights with the included smart remote. You may go through 10 brightness levels and 3 different modes: smooth, flash, and strobe. 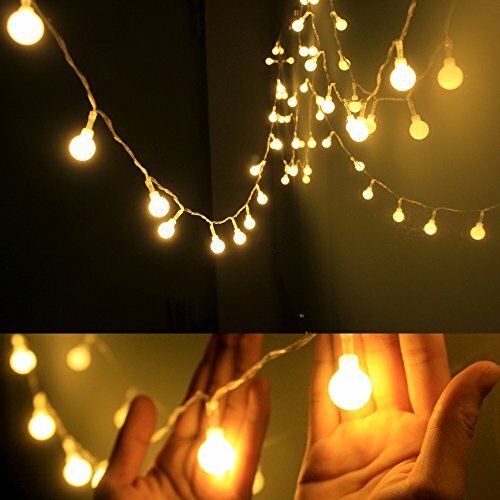 As long as you keep in mind that you may not extend/connect together the string light, you are good to go when installing the lights. Let’s not forget the part about the eco-friendly LEDs, as they are cost effective and energy efficient. You may safely use the lights for several hours as the risk for overheating is minor. The lights have a good build and may take a thunderstorm. They give a warm color and the copper wire is very flexible. The dimming options, the long copper wire and the soothing light may be the best strengths of the lights, in the end. Despite the minor issues, for the long wire and adjustability, the lights are worth to try for so many occasions and even regular use. 6). Looking great in any scenery, the Globe String Lights with G40 Bulbs (50ft.) by Deneve sure bring many good things to the table that trump all the inherent flaws. The lights come in a 50ft. string and they are easy to connect end to end. The 12inches bulb spacing creates a nice light effect, rather faint than bright though. One thing we really like about the lights is that one bad bulb doesn’t affect others lightings so this kind of makes it up for the fragile bulbs. Now that we’re on it, the bulbs do break but it’s very easy to find replacements and to replace them as well. You may actually remove and replace the bulb while the other bulbs remain lit. The lights look delicate, but work well and have a good built. They create a nice, warming vibe and the small clips on the base make installation way easier. Easy to install and coming for a very good price, the lights aren’t to be missed on when in need. For the soothing light and easy installation, the lights do make it to our selection as a reliable option to have in mind. 7). Are you ready for the heavy-duty lights that take all kinds of weather, all year long? Let yourself impressed with the Brightech Ambience Pro Commercial Grade Outdoor String Lights with Hanging Sockets. The lights do surprise with their heavy-duty build and the strong wires make them able to withstand all weather challenges. However, it’s not only the build that we like on the lights, but their looks also. The exposed filaments do look impressive and create a romantic glow. The lights come with black casing that has a retro feel. The 7 clear 11-watt S14 incandescent light bulbs are nicely spread on 24ft. long industrial strength strand. The light is bright enough to help you dine, but not too bright to ruin the nice atmosphere. The lights are built with the WeatherTite technology and Ambience Pro, which means they illuminate efficiently, whereas the several layers of insulation protect against extreme hot/cold temperatures, windy, rainy or damp conditions. The cord is rubbery and flexible, yet long lasting and tough. You may connect up to 8 strands end to end, no matter how you want. A loop on each socket makes installation easier and you may use zip ties, eyehooks, or even 16-gauge guide wire. The lights are also dimmer compatible so you may dim the lights when the situation calls for it. The neutral casing helps the lights fit into any scenery, which is great. Let’s not forget the lights are wired in parallel circuits so if a bulb breaks, the others remain lit. Despite the inherent flaws, we wouldn’t give a second thought when running into the lights on a shopping spree. 8). Durable and sending you all the way in Italy, the Proxy Lighting 48 Foot Weatherproof Outdoor String Lights are some great lights to use for your terrace, let’s say. The 48ft. cord includes 14-gauge wire strung through 15 light sockets, placed 3ft. away from each other. Both the light sockets and the cord are weatherproof, taking all weather conditions. Additionally, the cord is black and blends easier into any scenery. 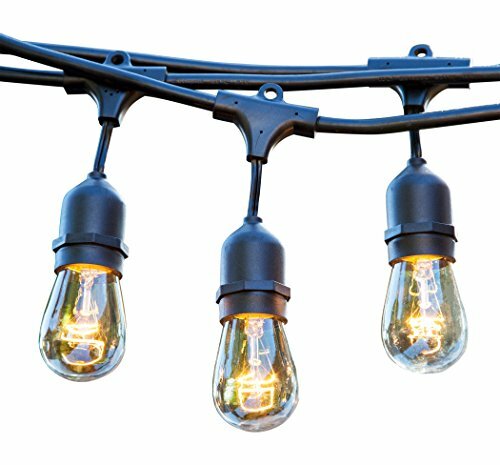 The heavy-duty rubber build of the molded sockets and the build-in hanging loops make the light strings a very durable option for any outdoor. The 11-watt incandescent bulbs are also dimmable, giving you the chance to find the right brightness for a specific situation. As for the installation, we notice the guide wires, the cup hooks or the zip ties with build-in loops making hanging a breeze every time. You may even connect up to 9 strings for covering a larger area or to brighten more your terrace. The cables are sturdy and everything about the lights leaves a durability feel. The high quality build, the great looks and amazing features create the profile for some perfect lights for many of us out there. No matter how we put it though, we still like the lights for their great build and nice appearance. 9). Get the high-end feel for your garden with the Deneve Outdoor String Lights (48ft) with Edison Bulbs. The lights present a commercial-grade build and may even handle a hurricane, according to some. They are weatherproof and easily take a snow. The 48ft. cord includes 14AWG gauge wire and 15 light sockets, placed at 3ft. away from each other. The light sockets and the cord are weatherproof and ready to take the extreme weather conditions. The cord is black and rubbered for easier blend, but the molded rubber sockets and the hanging loops aren’t bad at all. The end-to-end connections allow you to have the proper illumination for any area. The lights are easy to install and you should install the strand with the empty sockets. The bulbs are individually wrapped and the wire has a great quality. The lights present a commercial grade quality and impress with their build and light. In a nutshell, for the amazing looks and incredible build, you should definitely skip on the lights if light and durable is what you’re looking for your garden. 10). 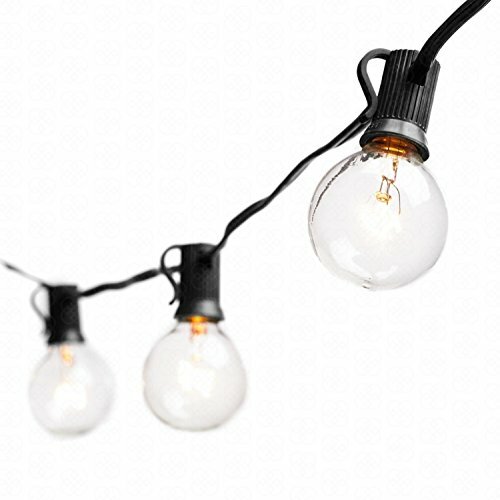 For those of you who’re on the run with the wedding preparation, a great option to cross from the “to-do” list is definitely the 100 Foot LED Warm White Outdoor Globe Patio String Lights – Set of 100 LED G40 Clear 1.5 Inch Bulbs with Black Cord. The package includes one black 100ft. C7 base light string and 100 G40 clear LED light bulbs. The result is that you manage to illuminate so nicely a patio or the outdoors, either that it is for your wedding or a regular summer night. The sockets are spaced every 12 inches, which gives the lights a wide coverage or the designated area, but also nice light effect. Each of the G40 LED light bulbs are .6watts so you get bright light, with 12 time less energy. Additionally, the LEDs are also water and weather resistant, presenting a 45,000hours life span. The lights have a good build and allow you to get very creative for installation. They are sturdy enough to handle a windy day and even bumpy transportation. You may use the lights both indoors and outdoors due to their good build. If one bulb burns, all the other ones remain lit, which is great. The bulbs are made of glass that doesn’t fade or lose its color. On the other hand, the LED bulbs handle a fall and don’t heat after several hours of use. Therefore, it’s a win-win situation with the set. The lights are true to length and the cord is tough and durable. They create a nice effect and ambience and come in 50ft. /25ft. length also. All things considered, for the good build and versatility, you should try the lights for a wedding party or some festive feel all year round.